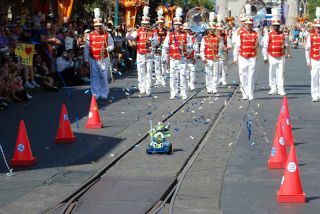 Buzz Lightyear, having returned to Earth after more than a year aboard the International Space Station, drives down Disney's Magic Kingdom Main Street USA during a ticker-tape parade in his honor. Thisstory was updated at 5:49 p.m. ET. Awell-traveled, 12-inch Buzz Lightyear action figure received a homecomingon Friday worthy of any full-size astronaut who returned after more than a yearspent onboard the International Space Station (ISS). DisneyParks and NASA cametogether Friday at Walt Disney World in Florida to celebrate Buzz Lightyear's landing with the launchof a contest for kids to design the "Toy Story" astronaut's missionpatch and debut a new online game as part of the "Space Ranger EducationSeries" on the space agency's Web site. NASA also used today to announce a competition for students to develop science experiments to be conducted onboard the station. "Itwas so amazing," Fincke told collectSPACE.com after the parade. "Youcould really see that the guests here at the Magic Kingdom were extremelyexcited and the kids were really excited. I thought it was good for NASA, goodfor Disney, and I was just proud to be part of it." "Sitting next to Buzz [Aldrin], that was amazing! Beautiful cars andeverybody was really excited and I felt like an American hero," he added. When BuzzLightyear launched aboard space shuttle Discovery's STS-124 mission in May2008, all seven of his "crewmates" had a patch to representthemselves and their mission's goals. When he arrived at the station to beginhis stay, the astronauts and cosmonauts who came and went while he was thereeach had mission patches of their own. In fact,all the astronauts who flew before Lightyear since 1965 have had their ownemblems. BuzzLightyear, on his own mission to star in educational videos for NASA outreachprograms, had no patch. To correctthat oversight and to engage students, NASA has partnered with Disney Parks tohold a contest open to children in grades two through six to design an insigniathat honors the country's first and longest-servingspace ranger. "DisneyParks and NASA feel it's only fitting that Buzz's biggest and true fans aregiven the opportunity to design a one-of-a-kind mission patch to celebrate hisdream come true. We have no doubt the submissions will be unique and creative-- if anything, a very hard decision to make!" said Duncan Wardle, vicepresident for Disney's Creative, Inc.
Beginningtoday through Nov. 6, children and parents can go to the Disney Parks' Website, download a template and design a custom Buzz mission patch. Kids canchoose from designs and art inspired by previous NASA badges, as well as NASAand Disney creative elements and other add-ons. Along withtheir patch design, children must also submit a 100-word or less essaydiscussing the inspiration for their emblem. The winnerand up to three family members will receive a four day, three night vacation atWalt Disney World, as well as a VIP tour of the Kennedy Space Center. NASA willalso fly the winning patch into space and award it to the winning childpost-flight. NASA also plans to reward the winner in a way only it can. "It is a great honor to carry a patch with you to space," sharedFincke. "So, we're giving the opportunity for kids across the country tocome up with a really neat patch and we will take the winning design, we willmake several copies of it and fly them in space and return one copy to thedesigner." "If you can imagine yourself as an eight or nine year old kid, I thinkthat being part of the space program like that, that's pretty amazing,"said Fincke. NASA alsodebuted today a game on its website featuring Buzz Lightyear, as well as asecond design challenge for students to conduct experiments on the spacestation. Continuereading at collectSPACE.com to learn more about the new game,experiment challenge and to see photos from today's tickertape parade.